There is clear evidence of a cooling effect in the GHCN-Daily data resulting from large volcanic eruptions during the 19th and 18th century. If an eruption of a similar size to Tambora were to occur today it would (temporarily) cancel out all CO2 warming. The severn largest volcanic eruptions in the last 270 years compared to Global Land Temperatures. The 3 largest eruptions all occurred before 1850. A comparison of GHCN-Daily with CRUTEM4 is shown in Green. Note that early ‘Global’ temperatures are dominated by European stations. This is probably why Laki appears to be as strong as Tambora, which had a much larger effect in Asia. By comparison the 20th century and the 21st century so far has seen far less Volcanic activity. Mount Pinatubu caused a temporary short term drop in global temperatures of about 0.4C for 2 years. Another Tambura type event would be far more serious with longer lasting effects. After-all we know how cold it can get at night! This entry was posted in Climate Change, climate science, UK Met Office. Bookmark the permalink. Is there any significant difference between basaltic slow flow extensional regime volcanic effects and acidic explosive subduction types? I am not a Vulcanologist, but what seems to matter most is acidic aerosols (Sulphur, Sulphuric Acid) ejected high up into the stratosphere lasting for several years. This reduces net incoming solar radiation quickly cooling land surfaces. Acid rain and ash fallout, cooling temperatures, then hinders agriculture leading to famine. etc. Interesting whether Krakatoa also impacted the boundary conditions of the oceanic dipole. 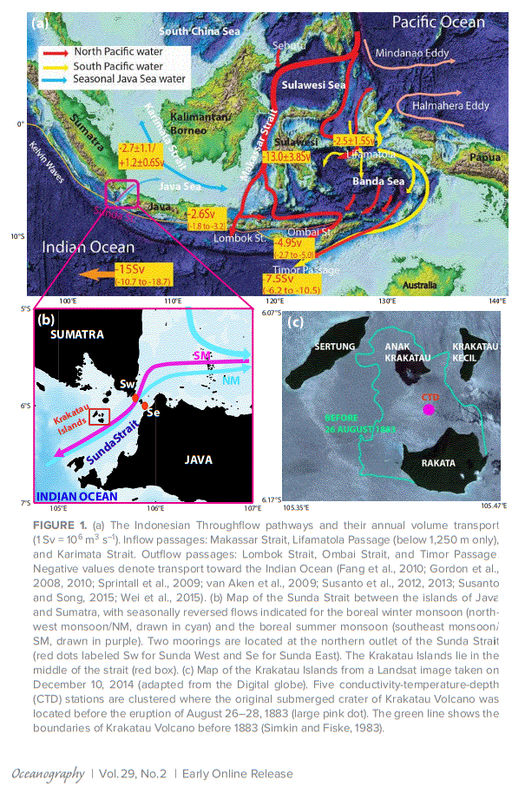 The island actually grew in size and may have modulated the Indonesian Throughflow at the Sunda Strait. No doubt that tectonics affects ocean circulation and as a result long term climate. CO2 cancels out its warming, all by itself. Is this the infamous “geran” that argues that objects don’t rotate when in orbit? You appear somewhat confused, Paul. What you may be referring to are my explanations, elsewhere (and completely off topic here), that the Moon does NOT rotate on its axis. Technically, the moon rotates once per month. Well Ron, if you want to get really technical, the Moon orbits in about 27.3 days (sidereal), and in about 29.5 days (synodic). But, it NEVER rotates on its axis.